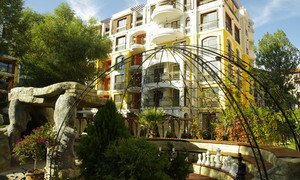 Would you like to be a proud owner of a seaside property in Bulgaria? Imagine splurging in your own affordable luxe, that’s just a stonecast from the shimmering shores of the Black Sea. Sounds dreamy, doesn’t it? Well, that’s what the residential complex Harmony Suites 3 is exactly – dreamy. Harmony Suites 3’s refined elegance will leave a stark impression on you the first time you admire its beauty. The building’s layout can only be described as fascinating: there are six floors, and each of them bears the name of a continent. For example, the sixth floor symbolizes Australia. Meticulous landscape design, rattan outdoor furniture, petite alcoves, verdant areas for walking and recreation, and manicured to perfection lawns. Everything here suggests that this complex has one purpose – to relentlessly pamper you with the ultimate coziness, both indoor and outdoor. Sports playgrounds and a fully-equipped gym. Harmony Suites 3, as well as all other Harmony Suites complexes, offer a superb level of customer service, ultra-convenient seaside apartments, and well-established infrastructure. You’ll be further seduced by the staggering mountain view, the shimmering beach areas with golden sands, and the comfortable SPA center. Don’t miss your chance to own your own affordable luxe at the Bulgarian Sea coast. Interested in buying a luxurious property in Harmony Suites 3, without breaking the bank? Click on the green phone button on the right, and we’ll call you shortly to help you choose the perfect apartment for your needs.